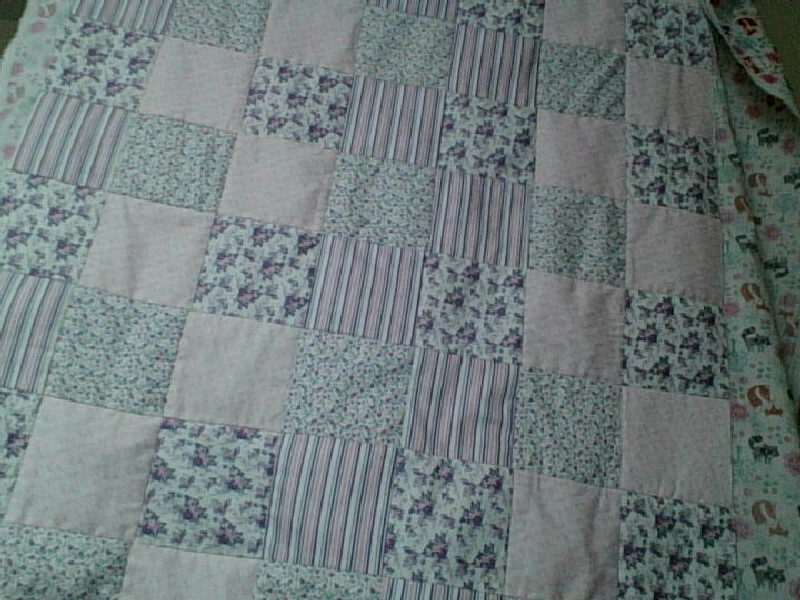 While the rain hammers down and walking turns into paddling I have almost finished the child's quilt. The colours are much brighter than they show, they come from some charm square packs made from fabric designed by Kirstie Allsopp. I bought them a while ago and have only used a few, there are enough left for at least one more small quilt. 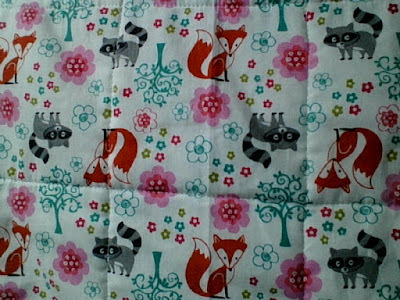 I have backed it with this fun print, some of the colours are repeated from the front so I aim to try self binding it. 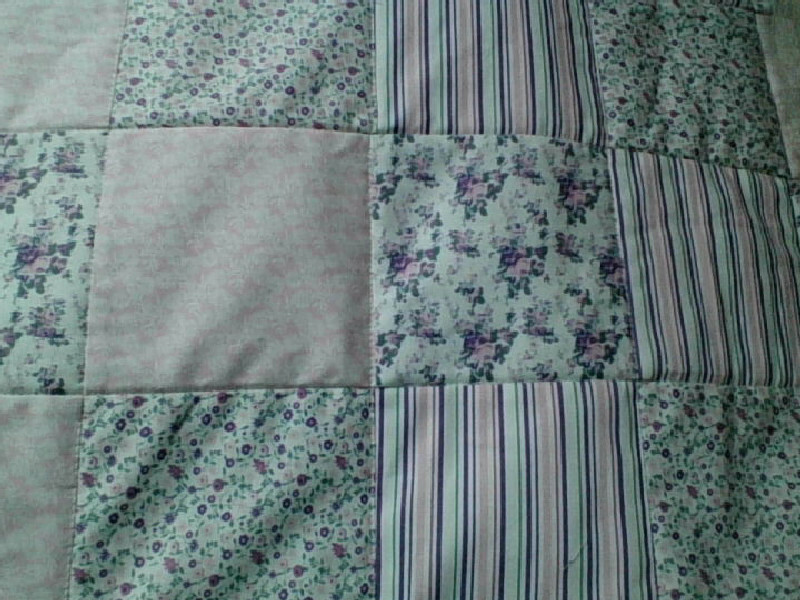 Once the backing is folded round to the front I will see how I feel. All the threads are pulled through and tied off, the ends will be contained within the binding. 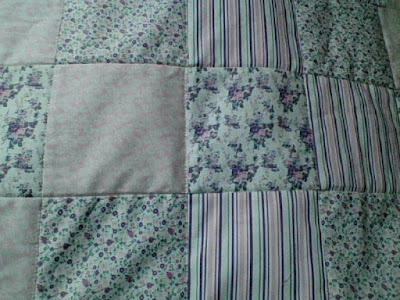 I may use some of the backing fabric to make a little bag to hold the quilt. Most small children like a bag to drag around and constantly fill and empty with their treasures. I considered putting pockets on the front but will leave that idea for the next size up. I made one like that for Junior and he had great fun selecting his favourite little cars to hide in the pockets. I did a little knitting this morning and the latest sock is almost done, I have started the toe shaping. That will be finished and the next one cast on while telly watching and sofa surfing later. I hope to get to see the one armed bandit before the weekend, it all depends on the weather, there is no pleasure in trudging through rain, unless you have a Springer Spaniel of course. My three would get really excited by this weather and demand to go out and then be reluctant to go home. I did not get to walk the dogs this morning, I am pretty hardy and have waterproof gear but the wind was causing rain whirlpools. It was just a step too far. Now I am off to trim and press the backing ready to fold round and sew down, I want this finished tonight and will cut the bag out ready for tomorrows sewing. Darling quilt! Love the backing fabric.